Crunchyroll - Library - What is the right order to watch this anime? 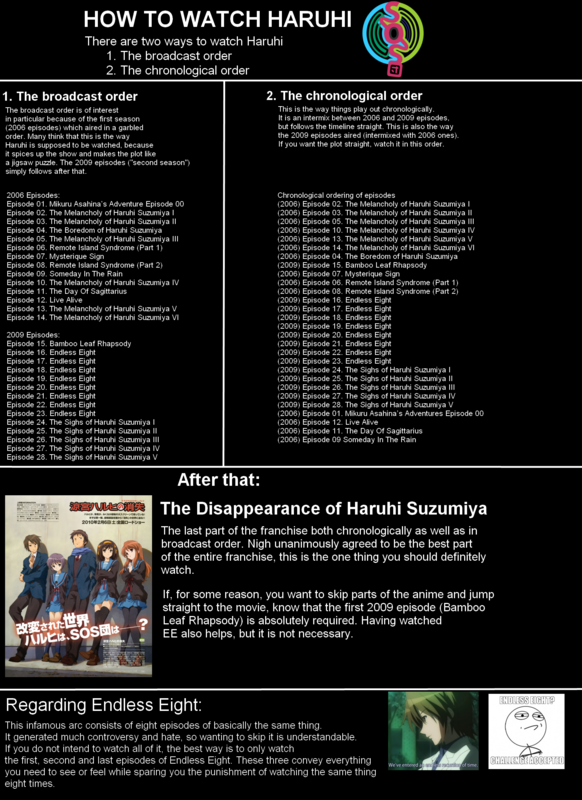 CR / Library / The Melancholy of Haruhi Suzumiya / Forum / What is the right order to watch this anime? What is the right order to watch this anime? I have been wanting to watch this anime for awhile but the MAL page has this wikipedia link about how it aired in a nonlinear order in the tv compared to the way it was in the manga..
Should I watch this in the nonlinear way how it is currently in crunchyroll or use the wikipeadia list to watch it in a chronological order how it happened in the manga? I cant seem to edit my old post so I will add here that I dont know if chrunchyrolls order is the way it was aired or how its in the manga. I got mixed up with the list while I was writing this. Above post is useful. I think Crunchyroll has it in the 2009 broadcast order. I think that means for original broadcast order you'd watch 25, 1, 2, 7, 3, 10, 9 etc... I think. I too am confused. I've been told to watch in original broadcast order though. 25, 1, 2, 7, 3, 10, 9, 11, 28, 4, 27, 26, 5, 6, 8, 12-24 is the broadcast order, watch it that way, you're supposed to be confused, but that makes figuring it out more fun. So interesting to watch this anime with some tricks. Although there are some books which can be read randomly or read by odd or even chapters to bind the story of each main characters well, it's the first time I found this kind of anime. Unique. There is 5 different orders to watch Haruhi and from looking at them and the nature of the series, it doesn't matter which of those orders you choose. The wiki page that TastyWhale posted is the best to look at all 5 orders.